Kolster's TAKE ME TO THE RIVER, a 240-page book, was published in November, 2016, by George Thompson Publishing. TAKE ME features tritone reproductions of 185 of his ambrotypes of four rivers and essays by curator Alison Nordström and environmental historian Matthew Klingle. TAKE ME has been reviewed by Photographers Forum and PhotoEye Books and the project has been featured in Oxford American's Eyes on the South, and as the daily image in the "Don't Take Pictures" blog. In recent years he has mounted solo exhibitions at The American University of Paris, Schroeder Romero & Shredder Gallery in New York City; the Bowdoin College Museum of Art in Maine; Page Bond Gallery in Richmond, VA; 621 Gallery in Tallahassee, FL; the College of Southern Maryland; SRO Gallery at Texas Tech in Lubbock; and Space Gallery and PhoPa Gallery in Portland, Maine. Loupe, the Journal of the Photographic Resource Center at Boston University and Memorious published portfolios of his river photographs in 2013. An earlier project similarly concerned with land use policy and its implications, entitled Changing Places, depicted changes in Las Vegas, San Francisco and New Orleans over a 10-year time span. In 2009 a 23-image portfolio from Changing Places was acquired for the permanent collection of the George Eastman House International Museum of Photography in Rochester, NY. Work from the same series was featured in Consilience - The Journal of Sustainability, published through Columbia University. 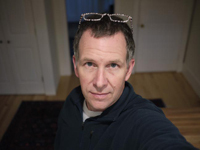 Since 2002 Michael has maintained a website, The Daily Post, to which he posts a photograph everyday (http://DailyPost.bowdoin.edu).